Texas has its first window named after the great state of Texas, private labeled by Amcraft and and manufactured by Simonton Windows JD Powers Award winner four years straight. This is a first for Texas and we here at Texas Home Exteriors located in Houston TX are excited to offer the first window named for our great state. Two energy efficient vinyl replacement versions are offered to the greater Houston, The Woodlands – Spring TX metro area. The Texas Home Exclusive and the Texas Home Exclusive Plus. Just think how great it is for homeowners to have beautiful energy efficient vinyl windows that are named for our wonderful state of Texas. 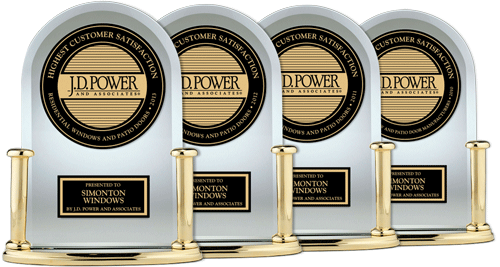 Make your selection with confidence knowing our windows are manufactured by JD Power Award winning manufacturer, Simonton Windows. This is a nice insurance bonus for Texas homeowners. 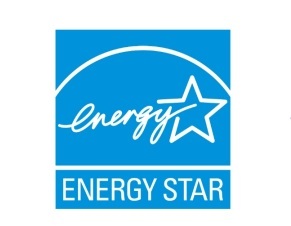 With our Energy Star rated windows, TX homeowners will realize the benefit of energy savings on their utility bills month after month, year after year. Texas Home Exclusive Windows two options with low-E, argon gas filled double and triple pane windows. How do energy efficient vinyl replacement windows work? 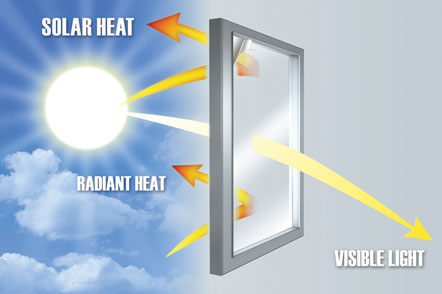 Here at Texas Home Exteriors we are often asked questions about windows such as, “how do energy efficient windows work?” and “how much savings will I realize on my utility bills?” Several components of the window work separately for each of the following scenarios but together as a whole to make your Houston TX home more energy efficient. When it comes to the sun hitting your window, our windows include Low-E coating which reflects the suns UV rays back out, stoping the UV heat from entering your home. In most cases, it will block out 80-90% without making your windows too dark. After our vinyl energy efficient replacement windows are installed, you will notice that you can now get closer to your window with the summer sun blazing in and feel 80-90% less of the sun’s UV heat getting through and warming your skin. This will translate into summer utility bill savings due to the the sun’s hot rays not being allowed to enter your home so no need for the AC to work as hard. The climate controlled environment in your home that we call heat or air conditioning is constantly trying to escape. Your single pane windows have the lowest what is known in the building industry R-Value/U-Factor = “resistance” for temperature to travel thought any material from one side to another. Argon Gas is heavier than air and is placed and sealed in-between the two window panes of glass making it more difficult for any temperature to travel from one side to another and increasing the window energy efficiency. Another words what I call invisible insulation that will increase the R-Value/U-Factor of your windows. What is the difference between U-factor and R-value? U-factor is used to measure the insulation value of windows, R-value is used for insulation in most other parts of the building (walls, floors, roofs). True that they are related, different test criteria are used in calculating the two values so they cannot be directly converted. Take R-value and U-factor, divide 1 by the U-factor number, E.g. : a 0.25 U-factor will equal a 1/0.25 = 4 R-Value. What makes these windows great is not only do they carry our beautiful state’s name TEXAS but they are manufactured by Simonton and at an affordable price compared to competitors windows such as Anderson and Pella windows. I am Greg Kapitan and started in home improvements in 1982 in my hometown of Long Island, New York just outside of NYC. With over 30 years experience, my love Shelly and I now reside in The Woodlands, Texas running our own businesses providing roofing contractor services siding installation and home window replacement services to homeowners in Houston and The Woodlands TX. Be sure to check out our website at https://www.TexasHomeExteriors.com and feel free to connect with me and contact me directly at Greg@TexasHomeExteriors.com, I would love to hear from you! Aside | This entry was posted in Energy Efficiency, Energy Star, Home Improvement, Houston Texas, r-Value, Replacement Windows, Texas Home Exclusive Windows, Texas Home Exteriors, Texas Windows, The Woodlands Texas, Window Options, Window Replacement, Window Types, Windows and tagged energy efficient windows, energy star windows, houston texas, Low emissivity, Replacement windows, Texas Home Exclusive Windows, Texas Home Exteriors, Texas Windows, Window Replacement. Bookmark the permalink.